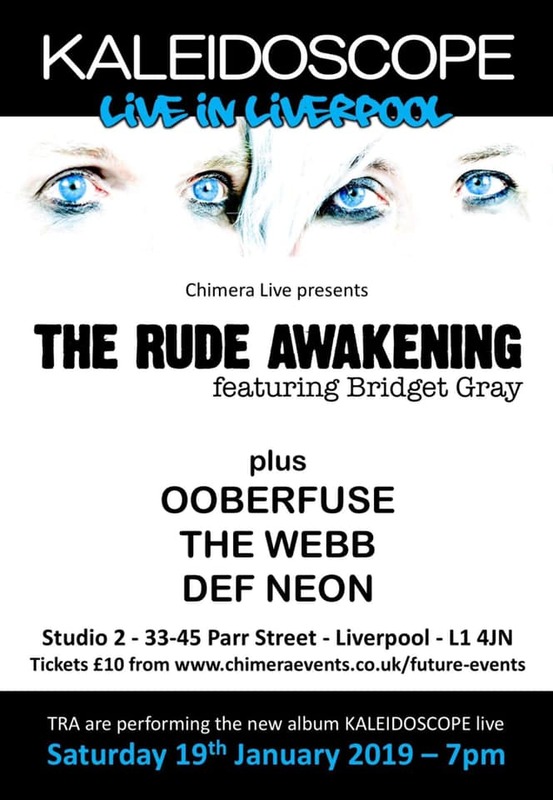 The Rude Awakening featuring Bridget Gray performing their much anticipated debut album Kaleidoscope at Studio 2 in Liverpool. The Kaleidoscope album represents 12 months of studio creation by TRA’s Johnny Normal and Bridget Gray. The songs explore emotions, relationships, taboos, fantasies and fears and challenge common perceptions and convention, presenting such subjects in an entertaining and stunning synthesizer-steeped soundtrack. The Rude Awakening is the Anglo-Scottish combination of Johnny Normal and Bridget Gray. Johnny has many years of electronic music experience under his belt, with four albums to date, recording, collaborating with and supporting the likes of Adam Ant, Blancmange, Marco Pirroni, Altered Images, Wolfgang Flur, and performing at festivals and gigs throughout the UK. Bridget is a singer/songwriter from Aberdeen, also one half of Scottish synthpop act Destination, and her amazing vocal talents are in demand from artists and producers around the globe. Together they create exciting, emotive and sometimes startling synthesizer-drenched songs exploring the many facets of modern urban life and 21st Century situations. A fresh and unique electronic act with the undeniable influences of synth pioneers such as Gary Numan, Orchestral Manoeuvres in the Dark and Soft Cell. Goth-electronica-punk-spacerock combined in a beguiling fusion. DIY ethics in a time of their own with schizophrenic tendencies! A band who fuse elements of indie-rock, electro, synthpop and bass music to create a sound that has been described by critics as energetic, intense and unique. Having formed as a traditional guitar-based rock band, a mutual love of all things electronic soon emerged as the band began to reinvent their material using sequencers and samplers. The resulting sound has proved popular with live event organisers and club promoters alike, leading to support slots with 65daysofstatic, Death in Vegas, The Orb, Pop Will Eat Itself , The Algorithm and Sonic Boom Six.